Long time no see! The past six months have been so very busy: in-between sleep struggles with Gideon, working a lot of hours as a work-at-home-mama, the holidays, and my first trimester I just didn’t have it in me to fit in blogging as well. 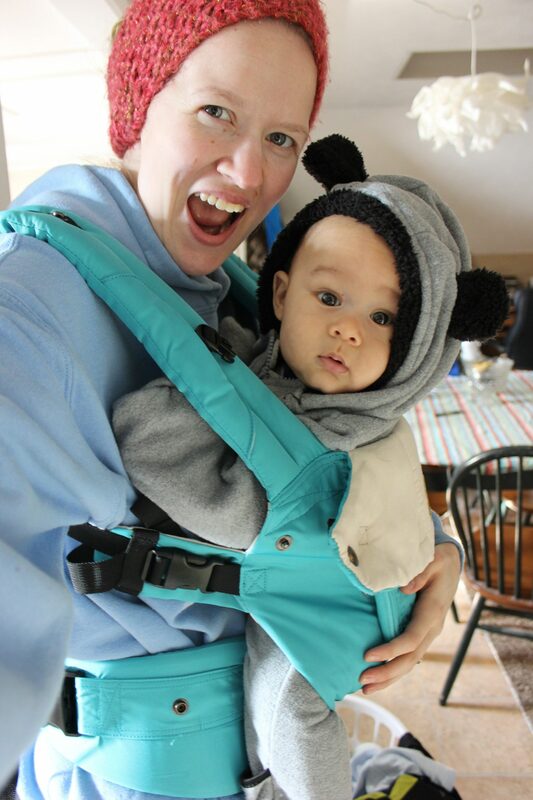 I have really missed my readers, sharing my stories, and chronicling all the ins and outs of early motherhood. It has been on my heart to start blogging again for awhile now. 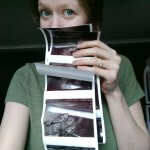 And what better time to start than to document my second pregnancy? I have a post in the works giving you a complete history of the past six months (what we’ve been up to! ), but first I wanted to share my first-ever bump date for baby #2! 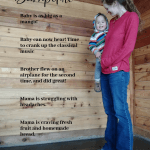 Before the pregnancy: We knew we wanted to have a second baby, and I had a short list of things I wanted to accomplish before I got pregnant again. This list included researching and choosing a VBAC-supportive provider, going to the dentist, becoming physically strong again (through running, good nutrition, and supplements), taking quality supplements (including magnesium oil which was supposed to help prevent morning sickness), and committing a lot of time to prayer over my second pregnancy before it even began. 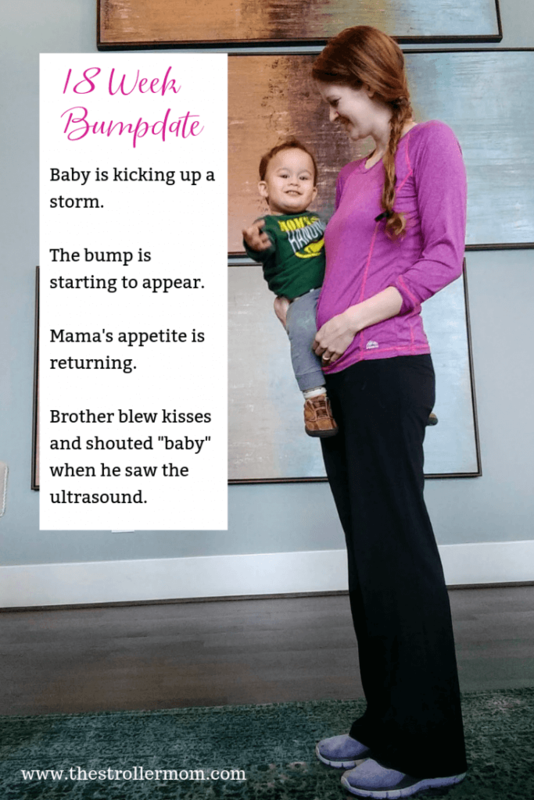 I happily ticked off every one of these items before we got pregnant, and was as ready as I would ever be before the second line turned pink on that pregnancy test! Gender: Don’t know. Saia REALLY wants to find out, and I really don’t. So at our 21-week ultrasound we are going to have the sonographer write down the gender, and Saia will read it and I will not. He will then be sworn to secrecy until the baby is born. Complicated? Yes. Doable? I think so. Saia is really good at keeping secrets, and I feel really strongly that I want to wait until birth to know, so I think we’ll be able to handle it. Hopefully. Ha ha! Weight gain: 1-2 lbs. I lost five lbs during my first trimester, so haven’t made it back up to that weight yet, but thankfully my appetite is finally starting to come back. During my first pregnancy, I was so worried that I wasn’t gaining weight at this point yet, but it doesn’t even bother me this time around. I’ll start gaining eventually. Ah the peace of having been through this once before! What I’m googling: Toyota Siennas. We are planning on buying a used minivan this summer, because our little car that I’ve been driving for the past nine years is just about to hit 200,000 miles, and is becoming less reliable. Purchases I’ve made/what I’m dejunking: Nothing purchased for this baby yet. I did sort through all of Gideon’s baby clothes and get rid of a bunch, and organize the rest by size. If this baby is a boy than it will workout perfectly since they will be born during the same month, and the clothes will be the correct season. If it is a girl–we’ll have to stock up on some little skirts and hair bows! I also got my Amazon Baby Registry box which you can get for free if you are can Amazon Prime member, and fill out a Baby registry. In it, I received this super cute Zebra swaddle blanket, a bottle, a bunch of wipe samples (including Water Wipes, which I’ve wanted to try for awhile), and a few other samples as well. How are you feeling? Overall, I am feeling a million times better than during the first trimester. Last week I did have a five-day headache that just about killed me. It all started due to the time change: I lay in a wonky position for a long time trying to get Gideon to sleep (this was also the day I decided we need to wean him from nursing to sleep, which we did, life changer!) My neck and shoulders were tight, and sore and that eventually developed into a full blown migraine by the end of the week. I did go to the chiropractor, apply heat packs, and took some Tylenol. Eventually, I was in so much pain that Saia called around and got me in for a prenatal massage which totally got rid of it! Ever since then, I’ve been trying to be way more aware of how I hold my head and neck, and really hit the water hard. Headaches were a problem during my first pregnancy too. I am happy to say I haven’t had another headache since I made those changes, so here’s hoping! Maternity clothes: Wearing maternity jeans, and regular shirts for now. Although I did wear a maternity shirt the other day and it was just so much more flattering. I might make the switch completely soon, because I feel like it made me look pregnant rather than just thick around the middle, ha ha! Best moment this week: Gideon just learned the word “baby” from a book we read to him. I was posting Baby #2’s ultrasound picture on Instagram, and G saw it. He immediately yelled “baby!! Baby! !” and started blowing kisses at the picture “mwa! Mwa! Mwa!” It gave me goosebumps. I don’t know how he saw the grainy black and white picture, and made the connection that it is a baby, but it felt like a little blessing from God to assure this mama’s heart that adding a baby to the family will bless Gideon, and not displace him. I’ve had a lot of big feelings about him, in regards to this pregnancy, and I so badly want him to feel loved and secure throughout this whole journey. Movement:Multiple times a day! I first felt the baby at 13 weeks pregnant, and consistantly started feeling him/her at 16 weeks pregnant. Cravings: I’ve had very few cravings for this pregnancy, but A LOT of food aversions. The things that taste the best this time around are fruit, homemade breads, and milk. I am hoping my extreme meat aversion will go away soon! Symptoms: headaches, food aversions, occasional ligament pain. VBAC Research: I am listening to a lot of VBAC birth stories, and reading a lot of blog posts about successful VBACs. Looking forward to: I am looking forward to the 21-week ultrasound. I am nervous about it, too, because that is when they’ll be able to tell us for sure whether placenta previa is there or not. But I am trying to focus on the fact that we’ll get to see baby again! 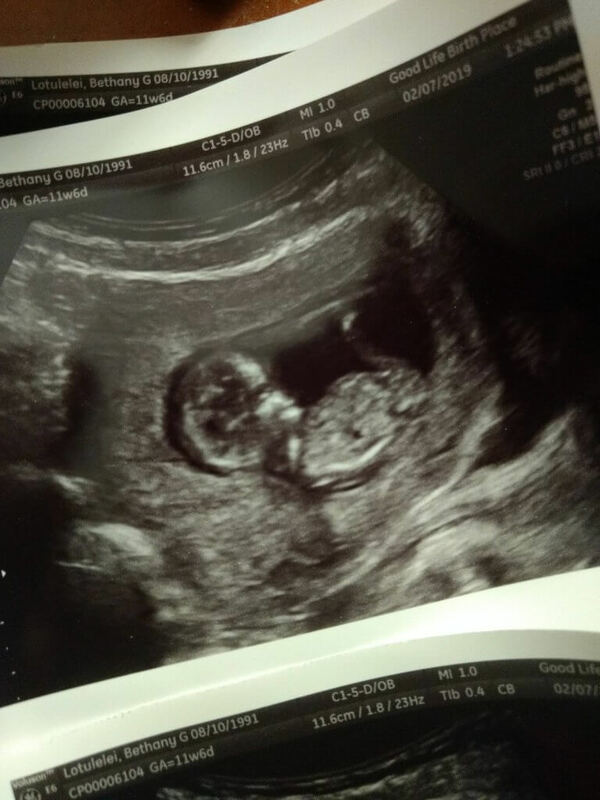 We saw him/her on an ultrasound at 12 weeks, which was fun! But Saia missed it completely, because Gideon melted down. This time around we will be having Gideon stay with his Amma and Opa so that we can focus on the ultrasound, which will be fun! 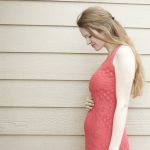 How was I feeling at 18 weeks with Gideon? Alright readers! What questions do you have for me? Drop them below! Hurray! Congratulations to you! Having a second baby adds so much sweetness to a family. 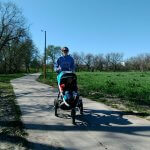 Love reading about your family….would like to know what you feel about the DFW area. It can be a bit intimadating – but hopefully you’ve fit in. Prayers!